Not long after this, I bought an LP record of Bach Organ Favorites recorded by E. Power Biggs and listened to it carefully. This was all it took for me to come under the spell of the entire creativity of this enormous man Bach. In order to play his music, we have to cross the border into the realm of serious study, if we haven't already, and another step-up in a personal instrument is necessary ... we're talking here about a loaded 2 manual classic voiced organ with a full 32-note pedalboard and adjustable combination action at a minimum. The pricetag on an instrument like this takes an exponential leap upwards and often places it completely out of reach financially for the average person ... the average person, that is, who never prays about it. I prayed the prayer of faith on this, too, since I had a family of my own by this time and could not afford the kind of instrument I really needed for this kind of serious study [See blog, The Power of Prayer, Part I]. But, then again, I knew that God would not have brought me this far along without standing behind everything I felt called to do for Him as a servant in the music ministry. About a month later I visited a local music store, and when I walked in my ears were met with the wonderful sound of a beautiful Baldwin 636 analog church organ, one of the finest from the analog era (photo). This instrument was much larger than the other organs the store typically sold, so I asked the store manager who was playing the instrument at the time if it were for sale, and he said it was. He said the church in Saint Louis where it came from had a fire recently; the organ sustained some smoke damage in this fire to the cabinet of the console, but otherwise, the organ was in perfect working order. When I asked him when the fire occurred he gave me a date which was right after I had prayed on it. 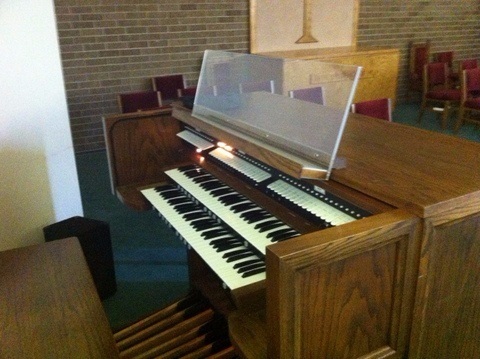 Since the insurance paid the church to replace its organ with a new one, the store manager took the old one back to the store and placed it in an ozone chamber for 3 days, which got all the smoke smell out of the console. New, the instrument sold for $18K, but he was willing to sell it for $6K, which represented a huge savings. This was a one-of-a-kind opportunity that would probably never come along again, and so, I told him I'd like to have it. With a small additional one-time payment and my instrument at home on a trade, I was able to afford another step-up personal instrument with a full pedalboard on which to play all classic music, including Bach ... a state-of-the-art pre-owned instrument back then in perfect working order which I never could never have afforded to buy brand new. The only thing it didn't have was a 3rd manual.